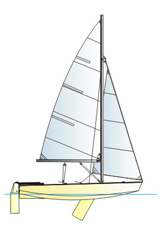 Hull length: 3.65 m Hull width: 1.43 m Draught: 0.15 / 0.90 m Sails area: 7 sq. m Mass: 70 - 90 kg Crew: 3 persons Designer: Marek Jankowski M. Eng. The Pooh is a small do-it-yourself sailing boat made of plywood, designed for those wishing to build their first boat on their own. The technology used, of "sewing and gluing" makes building much simpler and reduce the amount of work needed in comparison with the traditional methods. First yachts of that type were made in 1985. We sell documentation and description how to build the Pooh.